It was asking a lot to expect some opponents of Rep. Tom Emmer — that is, those who aren’t in the business of waiting on tables — not to try to hijack today’s odd showdown between Emmer and the people whose minimum wage he wants to cut — or the people whom he wants to see succeed, depending on whom you believe. One did, making it difficult for news consumers to know what part of today’s event was with real wait staffers, and what part of a hostile crowd was orchestrated by Emmer’s opponents. And that makes Emmer’s already-befuddling decision to keep an issue alive that’s been killing his campaign for a week all the more puzzling; the likelihood that he’d walk into a trap set by his opponents was entirely predictable. No doubt, there were legitimate waiters and waitresses in the audience to tell Emmer what they thought about his idea. 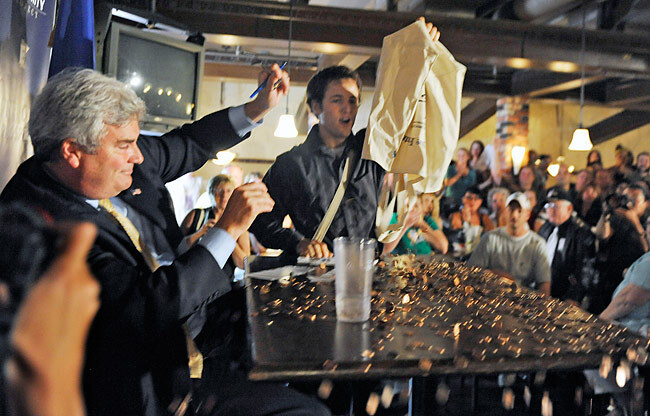 But when Robert Erickson (real name: Nick Espinosa) of Minneapolis tossed 2,000 pennies at Emmer to protest Emmer’s position on the Arizona immigration law, he hijacked an event that was supposed to belong to the waiters and waitresses, about whom so many people have professed to be concerned. They didn’t need his help; by all accounts, they were doing fine without him. Ironically, in his opposition to Emmer, he did the Republican nominee a big favor: He took the minimum wage issue off the table, and replaced it with the immigration issue, an issue that is right in Emmer’s political wheelhouse. It’s unlikely that many TV stations will be able to resist the image of Erickson’s coin toss at meeting of waiters and waitresses who went to the meeting to talk about something entirely different. If you didn’t know any better after watching a rather clumsy performance by Emmer’s campaign staff this week, one almost might think that was the plan all along. I have to disagree that this stunt took away from the tip message. I think it broadens the scope of the argument against emmer. But it gives Emmer the opening he’s desperately needed. It allows a fairly smooth transition away from the minimum wage issue. And Emmer’s position on immigration, only hurts Emmer with people who he didn’t have in the first place. I don’t think that claim can be made with the minimum wage issue. I do agree with Bob. The media, the public, et al., could have nailed Emmer to the wall over his refusal to voice his ideas of what a tip credit is, an action that made me laugh at so hard during my afternoon ride that I nearly caused a 6-car pileup on US-10 outside of Prescott. He pretty much killed the discussion and unless the DFL candidate(s) manages to put his feet to the fire regularly over the next 3+ months on it he’s inadvertently found a way out. To get an idea of why “waitress” is demeaning, picture in your mind an iconic “waitress” and then picture in your mind an iconic “waiter.” Which one was wearing the respectable suit-and-tie or even something like a tuxedo, or a white shirt, tie and long waist-tied apron, and which one was wearing the short dress, fluffy short apron, a funny little hat, white shoes, etc. –or even worse? I go by the AP Stylebook, which currently lists both waiters and waitresses as acceptable terms. Food servers doesn’t work for me because they’re not always serving food . And ‘servers” makes it sound like they’re slaves. Dunno Bob, just Googled Emmer and Pennies, 226 related articles, this has gone national. This hurts not only Emmer, but all Republicans. Effective political theater, do your best to dumb it down, you just can’t. If he were really interested in helping the workers, he would advocate going after the businesses that hire illegal aliens as kitchen help for $5 an hour and prevent legal US citizens from getting jobs. But wait, that would mean his buddies the wealthy restaurant owners would have to pay real wages to legal workers and that would cut into their profit margins! I am getting the feeling that Emmer’s handlers are inexperienced, intimidated, or both. While the stunt diverts attention away from the tip credit issue in the news cycle. All of the footage that is available will allow it to resurface later in the campaign. I have yet to see a single Robert Erickson “stunt” that backfired. Good TV is good TV, and the penny dumping made for a good picture too. What I think you forget is the symbolism pennies represent for wait staff. Pennies are tips meant as an insult. At best they’re part of a loose change tip, an emptying out of your pockets in lieu of folding (real) money. I saw the pennies and “insult” was the first thing I thought of, but then I’ve worked in restaurants. As have most Americans. I cannot think of a single area of work more Americans have engaged in. Emmer made a very big mistake in attacking wait staff, and Erickson kept the focus on the insult, not the excuses or the radical 180° turn from tip credits to no taxes on tips at all. Emmer is committing political seppuku while Erickson is just a jester amusing the crowd as they watch the condemned man building his own scaffold. Right on, Mark. The pennies made me laugh out loud. A penny is the tip a customer leaves if they thought you were TERRIBLE and doesn’t want to tip at all, but also wants you to know that they aren’t just a non-tipper. It’s a pretty grave insult. Too bad Emmer probably didn’t get the joke. seems like pretty much no other commentators agree with bob collins’ analysis on this one. the pennies were a perfect way to make the point that economic justice and immigrants rights are interconnected. did we forget that many servers ARE immigrants – both documented and not? the message shows to the public loud and clear – it’s only big media spinsters that are having problems with what is a truly radical (as in getting to the roots of a problem) and needed message. emmer’s campaign is in disarray, as it should be. any server would be fired if they were as consistently dishonest towards customers as emmer has been.